The Restoration Modular Revision Hip System combines successful designs with the latest technology to help answer the many challenges of revision hip surgery. 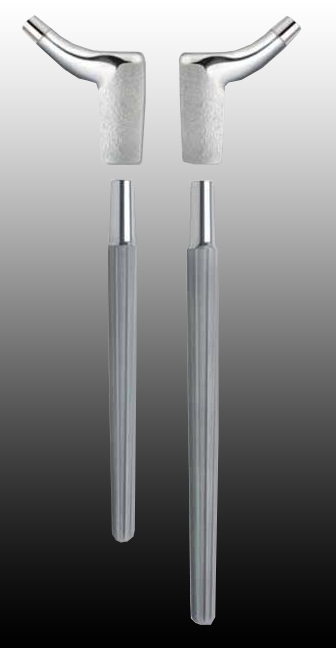 Restoration Modular is designed to provide you with a variety of proximal and distal component options to help achieve implant stability, adjust soft-tissue tensioning, and address leg length discrepancies. Restoration Modular helps to give you the ability to apply various fixation strategies depending on your preference and patient needs, allowing you to choose from a range of options to restore hip biomechanics. The result is an effective system for addressing various types of revision cases – designed to allow immediate fixation and long term stability through the restoration of hip biomechanics. Crucial to the success of any surgery is the stability of the implant and of the muscles surrounding the hip joint. Restoration Modular is designed to help you achieve fixation in a range of revision scenarios and varying bone types. The system helps to provide you with the unique ability to restore hip biomechanics, using a selection of options to address leg length, offset, range of motion, acetabular components, and anteversion. Restoration Modular is designed to enhance intraoperative efficiency in a number of ways. It helps to provide the versatility to address intraoperative challenges including leg length discrepancies and soft tissue tensioning, while catering to a variety of femoral anatomies, all at your surgical approach preference. The intuitively designed instrumentation helps to allow you to simply and effectively prepare the bone, helping to accommodate a range of technique options and nuances. The instrument designs are based upon familiar, proven techniques, helping to increase the mastery of surgical procedure. The instrumentation is also designed to allow you to effectively implant the device to best restore hip biomechanics.